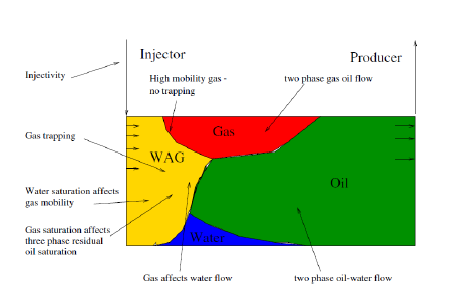 Water-Alternating-Gas injection was originally proposed to improve sweep of gas injection, by injecting water and gas alternately to control mobility of the displacement and stabilize displacement front. It combines high microscopic efficiency of gas injection and high macroscopic of water injection with the aim to improve overall recovery compared to gas injection/ water injection alone. It is very common to implement WAG as a tertiary method post waterflood/ gas injection IOR. In recent days, WAG method has become very popular because of its proven effectiveness in increasing oil recovery. Abundant availability of injectant (gas/ water), simplicity of the operations and growing concern on environmental issue also add motivation for its implementation. CO2 which is considered as Greenhouse Gas (GHG) and a major contributor to global warming can be introduced as well as other type of gases and injected in an existing waterflood project. Vice versa, water can be introduced in an existing gas injection project. Basically no major facility upgrade is required for a WAG injection, especially compared to polymer or thermal EOR which require high capital investment upfront. Also there is no significant issue is expected with gas availability because any type of gas can be used including CO2, hydrocarbon gases (lean/ rich gas), industrial flue gas or onsite generated gas (N2). Previous study (Iwan, et.al. , 2018) has shown that in low reservoir pressure application, performance of different type of injected gas is similar. In a field development study, quantification of uncertainty in reservoir performance is an important part of a proper economic evaluation. Business decision often require uncertainties to be identified, quantified and minimized. Identification and quantification are very important to determine better planning of surveillance/ lab test to reduce the uncertainties to an acceptable level. Therefore, identification of source of uncertainties in production and economics forecast in early phases of development would significantly ameliorate the data acquisition program. Development studies often involve reservoir simulation method to examine alternatives and formulate optimized injection/ production. Reservoir simulation enables integration of complex geological information and dynamic engineering data for planning and development of an oilfield. Assessment of different development scenarios utilize parameters like net present value (NPV) or cumulative production. This paper demonstrate typical workflow in reservoir studies involving reservoir simulation (although any type experiment, for example: physical experiment, can also benefit this technique). This paper also explain techniques that can be used to evaluate validity of the resulting equations.